Since this is a family-themed blog, I have decided to add a new feature in 2011. Every month or so, I will feature a family recipe from my vast collection of recipes from my mother and her sister, both grandmothers and one great-grandmother. When my mother died in 2007, I inherited her recipe box, a treasure trove of wonderful family recipes. This recipe for old-fashioned gingerbread comes from my maternal grandmother, Louise Norcross Coleman, whose photo is featured in my title. Since my Meyer lemons are slowly ripening, I have also added a link to my lemon curd recipe. Gingerbread and lemon curd are an unbeatable combo! 2. Butter a nine inch square baking dish. 3. Using a mixer, cream together the softened butter and sugar. Beat in the egg. 4. In a medium-sized bowl, sift together the flour, soda and spices. 5. With the mixer on low speed, gradually add the dry ingredients to the wet mixture. 6. Add the molasses and beat on low speed. 7. Pour in the boiling water and mix well with a hand spatula. 8. Turn batter into greased baking dish. Bake for 45-50 minutes, until cake tester comes out clean and cake springs back when gently touched. Yum!! I’m going to make both the gingerbread and lemon curd – hopefully over the weekend. 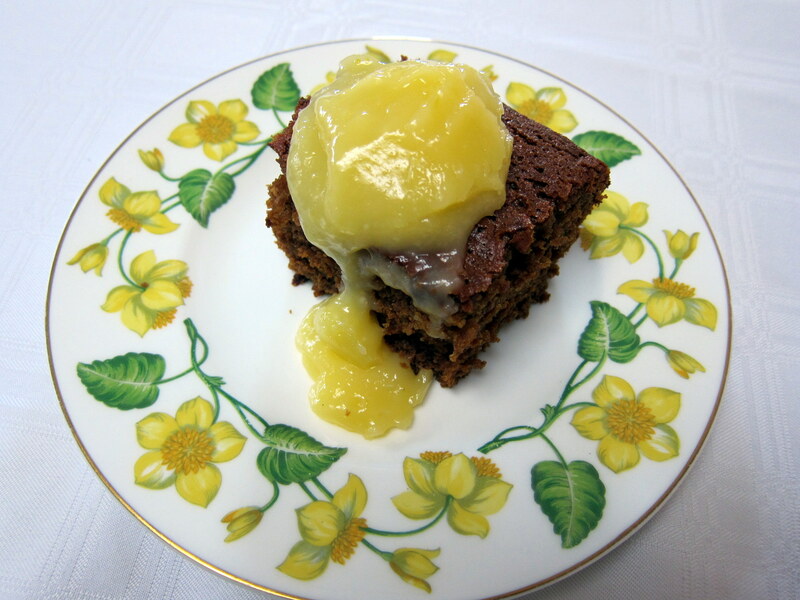 I love gingerbread but have never tried it with lemon curd – it sounds like a perfect combo! Today I’m finally getting around to making gnocchi. Do you have a blog, Susan? In any event, please post your gnocchi, just about my favorite pasta! Not yet. But once I get a couple things off my desk, it’s next thing to launch! I’ll post it for you though, assuming it all works out…. This looks great. I wish I had some right now. I will be making gingerbread this weekend. Does it freeze well? I froze some but have yet to defrost – usually, cake dries out a bit for me with my quirky fridge/freezer. You are right! Lemon curd and gingerbread make a wonderful flavor combination. This looks fabulous! Thanks – I’m shamed to tell you how quickly the dessert disappeared! I am on a continual hunt for a decadent gingerbread. This sounds like it may be the one I’ve been searching for! The next time I make my grandmother’s recipe, I’m going to add yet another teaspoon of ginger plus a handful of crystallized ginger – I’m a big fan of ginger. Anyway, keep up the good work, and I will see you at yoga.